JMS has stated that season five only happened on TNT with a lower budget than on previous seasons. I think I saw the figure $900,000 per episode in earlier seasons. Does anyone know what it worked out to be on season five? Obviously the lower budget came across on-screen frequently. While I was happy with the arc story of the last season overall, some of the stand-alone episodes didn't grab me at all. But I'm still very glad that TNT picked the show up. "Don't be sad because it's over, be happy because it happened." I don't think we ever had a firm figure. JMS said it never got much over $900K/episode. The main difference between 4 and 5 was that they (as I recall) didn't get the usual increase that they would have to cover the bumps in the actor's salaries (and probably other folks). This resulted in a shorter shooting week to make up for it. During the negotiations with TNT, JMS checked with John Flinn to see whether it was possible and Flinn said it wasn't. JMS asked him to do a test run with JMS directing Sleeping in Light on the shorter schedule and if it worked, Flinn would sign off on the idea. He did and they did. Curious what you saw that indicated a lower budget? I would have just assumed it given knowledge of how everything has gone with B5. "Do it cheaper!" While true in the matter of changing the actress, even under the old arrangement she wouldn't have appeared given what she wanted. If they'd given in to her requirements, it would have triggered raises for every one of the other main cast which would have priced them out of the realms of possibility. You're correct, though. I know that Stephen Furst got a couple of directing gigs in lieu of number of episodes he appeared in. Oh that is an interesting nugget. I like the episodes he directed. I think it would have been great to see more. Good question, Jan. The shorter shooting schedule makes sense, and some parts of season five seemed rushed. More scenes were taking place in hallways which all looked the same. The Zocalo was used a lot less, I would think because of the cost of paying all those extras to walk around. I don't recall the casino being used for any scenes after season three, which would have been more because Londo stopped going there. It all made the station feel smaller, less lived-in. It wasn't like the huge setting that was home to 250,000 that the series devoted so much work towards portraying in earlier seasons. Netter Digital's work seemed more uneven than what Foundation was doing in season 3, like all the explosions that didn't look like they fit the things that were exploding because they were filmed separately, I think that started in season four. Something I loved early on in B5 were the station interior CGI shots, the core shuttle traveling the length of the station and so forth. I thought it was too bad that they largely stopped doing that, it was really unlike what anyone else was doing with digital effects at the time. It was one of the ambitious, experimental things that really set B5 apart from the rest. Exploring the station's vastness and previously unknown areas was part of the fun of the series, the docking bays, the alien sector, the Cobra Bays... but not so much Grey 17. A lower budget basically dictates that this sort of thing take a back seat to telling effective stories, obviously. I also wonder what we would have seen while exploring Excalibur during Crusade? I do wonder what season five was supposed to look like before changes were forced by necessity. JMS had stated earlier in the series that season five would be all 'Wham! ', with more arc stories than the previous seasons. I would think budget dictated some of those changes, and JMS and company had to prioritize what they really wanted to focus on, while letting some stories and storylines go, or wait until later. Instead we got episodes like 'Learning Curve', a stand-alone episode that didn't really fit. Claudia Christian's departure obviously created some difficulties for the writers as well, but I'm afraid I don't know much about how that and the budget were related. I certainly enjoyed the Telepath Crisis, the ISA-Centauri War, Day of the Dead, The Corps is Mother, the Corps is Father, and other parts of season five which worked well. Last edited by Raw Shark; July 6th 18 at 16:19. More scenes were taking place in hallways which all looked the same. The Zocalo was used a lot less, I would think because of the cost of paying all those extras to walk around. I don't recall the casino being used for any scenes after season three, which would have been more because Londo stopped going there. It all made the station feel smaller, less lived-in. It wasn't like the huge setting that was home to 250,000 that the series devoted so much work towards portraying in earlier seasons. I definitely agree with all of this. These are some of my favorite things about B5 and they did appear less and less as time progressed. I would have loved to see a "Tour" episode where Garibaldi had to guide someone through important parts of the station we never saw. Or one where an actual guide takes us through and explains different amenities, like in Mind War when Ironheart is shown standard guest quarters. One thing I always found strange was that we saw a casino, batting cages, shops, restaurants, clubs, and a Mutai arena on B5, but no hotels. 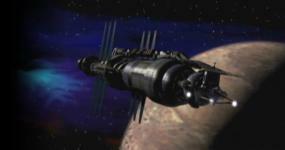 I guess JMS felt that with it being primarily a diplomatic outpost Earth Force would control all accommodations.